Another Great Evening of Classical Favourites. 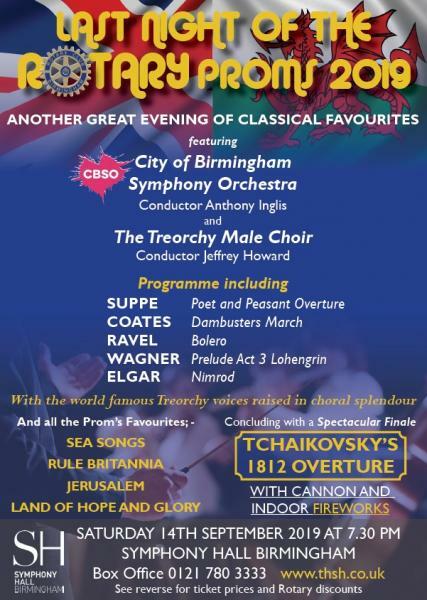 At the RIBI Conference in 2014 “The Last Night of the Rotary Proms” was sold out six months in advance and many Rotarians could not get tickets, so we did it all again in 2016 with much the same result. FOR GREAT ROTARY DISCOUNTS FOLLOW THE STEPS BELOW AND BOOK BETWEEN 1ST SEPTEMBER 2018 AND 31ST MARCH 2019 AND REMEMBER THE EARLY BIRDS WILL GET THE BEST SEATS!! EVERY TICKET (EXCEPT GROUP BOOKINGS) BOUGHT BETWEEN THE ABOVE DATES WILL BE DISCOUNTED BY £1 AND THE NORMAL PER TICKET COMMISSION OF £3.00 WILL BE WAIVED, MAKING A TOTAL SAVING ON A PAIR OF TICKETS OF £8. FOR GROUP BOOKINGS OF 20 TICKETS OR MORE ON THE TOP THREE PRICE BANDS ONLY, THE TOTAL PRICE WILL BE REDUCED BY 10% AND ONCE AGAIN THE NORMAL PER TICKET COMMISSION OF £3.00 WILL BE WAIVED. ALL OF WHICH MEANS A SAVING ON A PAIR OF TOP PRICED TICKETS OF NEARLY £14. WHY NOT GET UP A COACH LOAD OR JOIN WITH OTHER LOCAL CLUBS TO DO SO?